Shareholder activism directed at European companies is a growing and evolving reality for the Boards of quoted corporates. When such activism turns into a public campaign by one or more investors, there can be very significant financial and reputational risks for the targeted corporate and its Board. A&M has developed the “A&M Activist Alert” or “AAA” to predict which corporates will be the next to be targeted. The AAA is the most comprehensive statistical analysis of its kind. The analysis focuses on 1,473 corporates with a market capitalization of US$200 million or more, listed and headquartered in the U.K., Germany, France, Scandinavia, Switzerland, Benelux, Italy and Spain. The resulting predictive model successfully predicted the majority of corporates publicly targeted by activists since January 2015. The report is published twice yearly. We do not publicise the AAA scores for individual companies, or those that feature on our Red or Amber lists. However, individual companies can check their position on the Alert List by contacting A&M. Global professional services firm Alvarez & Marsal (“A&M”) today announces the findings of its latest analysis and predictor of shareholder activism in Europe, the “A&M Activist Alert”, or “AAA”. The study shows that Industrial companies are now predicted to be most in demand from activist investors. Global professional services firm Alvarez & Marsal (“A&M”) today announces the findings of its latest analysis and predictor of shareholder activism in Europe, the “A&M Activist Alert”, or “AAA”. The AAA reveals that the number of U.K. companies predicted to be under threat from public activist targeting has risen 13 percent to 60 over the past 12 months. 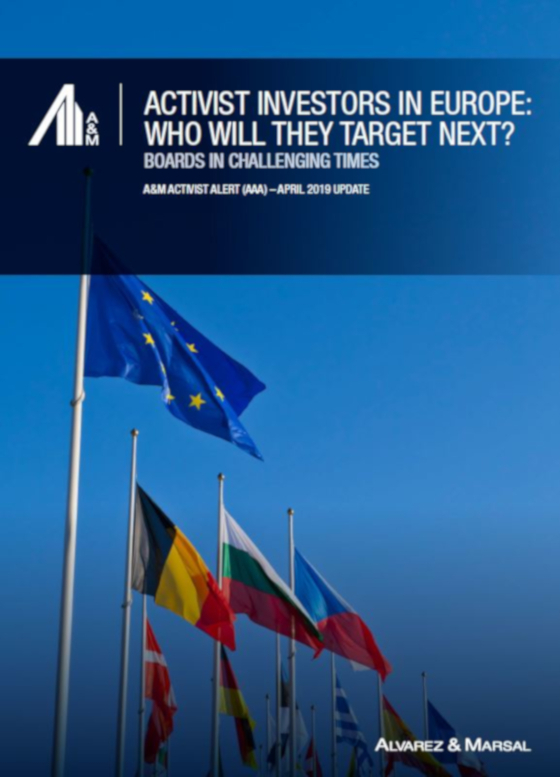 Global professional services firm Alvarez & Marsal (“A&M”) today announces the findings of its latest quarterly analysis of shareholder activism in Europe, the “A&M Activist Alert”, or “AAA”. Alvarez & Marsal (A&M) today announces the findings of a study identifying potential activist targets and the key levers that a company can utilize in reducing the risk of an approach. Alvarez & Marsal reveals the findings of its major 18-month research study which explores how Boards should address the unique, extraordinary disruptions that can challenge the very existence of a business.